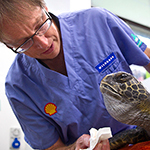 Join this world-leading programme offering postgraduate study in conservation veterinary medicine. The Master of Veterinary Studies (Conservation Veterinary Medicine) is the only programme of its kind in New Zealand. It combines the strengths of our world-leading veterinary school and the essential work of our Massey Wildbase team and the Massey University ecology group. New Zealand ‘s biodiversity is in crisis and the study of conservation medicine, disease ecology and ecotoxicology is crucial to protecting the remaining unique endemic fauna. Your learning will cover a broad range of conservation-related medicine including avian and reptile medicine, wildlife pathology, captive management of wildlife, disease ecology and ecotoxicology. Attached to Massey University’s veterinary school, Wildbase has four areas of focus: the hospital, oil response team and training, research and pathology. Massey University’s Wildbase Research Centre is an internationally renowned leader in the field of wildlife health and disease. Wildbase has New Zealand's only dedicated wildlife hospital and is having a huge impact on the survival of some of New Zealand’s most endangered birds and animals. We are the go-to hospital for the Department of Conservation, receiving wild and captive animals from all over New Zealand to diagnose, care for or perform autopsies. The Wildbase wildlife hospital is currently in the midst of a NZ$1.44 million expansion. Massey University’s veterinary programme is ranked in the top 50 universities worldwide by both the Quacquarelli Symonds (QS) ranking and ShanghaiRanking's Global Ranking of Academic Subjects. This course is run on our Manawatu campus in Palmerston North. Host to the only veterinary school in New Zealand, Massey University’s well-equipped facilities include an equine hospital, 24-hour pet hospital and sheep, beef, dairy and deer farms, all located near campus. The Wildbase wildlife hospital is the only dedicated wildlife hospital in New Zealand and underwent a $1.44 million expansion in 2016. You will have access to our other world-leading science facilities such as modern laboratories for virology and bacteriology, molecular and immunohistochemical work. Our courses are led by internationally-recognised lecturers and have a reputation for their use of real-life case studies and high staff to student ratios. Massey’s veterinary and animal science staff are integrated and cooperative. There is also a wide range of expertise across the sciences at the university, including agricultural science, fundamental sciences and engineering. This will give you access to a wide range of expertise, equipment and facilities on one small campus. Postgraduate study is hard work but hugely rewarding and empowering. The Master of Veterinary Studies will push you to produce your best creative, strategic and theoretical ideas. The workload replicates the high-pressure environment of senior workplace roles. Our experts are there to guide but if you have come from undergraduate study, you will find that postgraduate study demands more in-depth and independent study. This qualification will enable you to take up careers in zoos and wildlife health-related areas around the world. New Zealand has a very positive reputation for its work in conservation, with many countries keen to emulate some of our successes. Massey University graduates with expertise in this area are working all around the world, and also have a great reputation for their in-depth knowledge and innovative techniques. Dr Gartrell’s research primarily supports the conservation of New Zealand’s biodiversity, with an emphasis on wildlife health and ecotoxicology. He is the director of the Wildbase Research Centre at Massey. The Centre has research strengths in wildlife medicine, wildlife pathology, marine mammals, and oiled wildlife response. Dr Gartrell has authored over 70 peer reviewed scientific courses, eight book chapters in international scientific texts and over 100 conference abstracts/presentations. He has supervised nine PhD students and 22 Masters students. In 2010, Brett was awarded the Barry Munday Recognition Award from the Wildlife Disease Association (Australasian Section) in recognition of significant contribution to wildlife health in the preceding five years.